These workman are laboring to produce the steel shapes referred to in many of the stay maker advertisements. The blacksmith pounding on the anvil is working on a pair of steel stays, which is an exaggeration on the theme of using steel in women's stays. the woman is once again being fitted for her stays in petticoat and pocket. 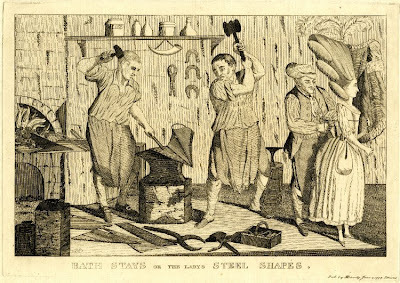 This print is entitled "Bath stays or the Ladys Steel Shapes" c 1777.